Are There Limits on Damages in an Injury Claim? After being injured by someone else’s negligence, you may want to know if there are any limits on what you can recover and what type of damages you can recover. Being in an auto accident in Washington DC (or anywhere) can be very scary and disorienting, and it's hard to remember what to do in the moment. The Department of Motor Vehicles has published this article for guidelines on what to do after an accident, and what your rights and responsibilites will be. 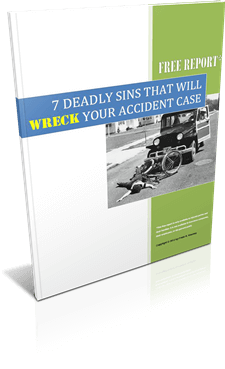 The summary is: 1) don't leave the scene of an accident 2) exchange information; and 3) file a police report. Everything you learned to do when you started to drive, hopefully. But what comes next if as a result of the accident, you have a serious injury? If you can't work and are recovering from surgery and will require treatement and rehab because of an accident caused by a negligent driver in the D.C. area? We can take care of all the legal issues to help you, while you focus on getting better. If you have been in a serious auto accident you may need help with questions about insurance coverage, paying for your medical care negotiating a settlement, and dealing with subrogation issues. Give us a call today to see if we might be a good fit for you - 202-393-3320. You will speak with a real person today and you'll see why our lawyers are a lot different than the ones you see on TV commercials. And don't forget to check our some of our free resources: just click on the images below for a free download.